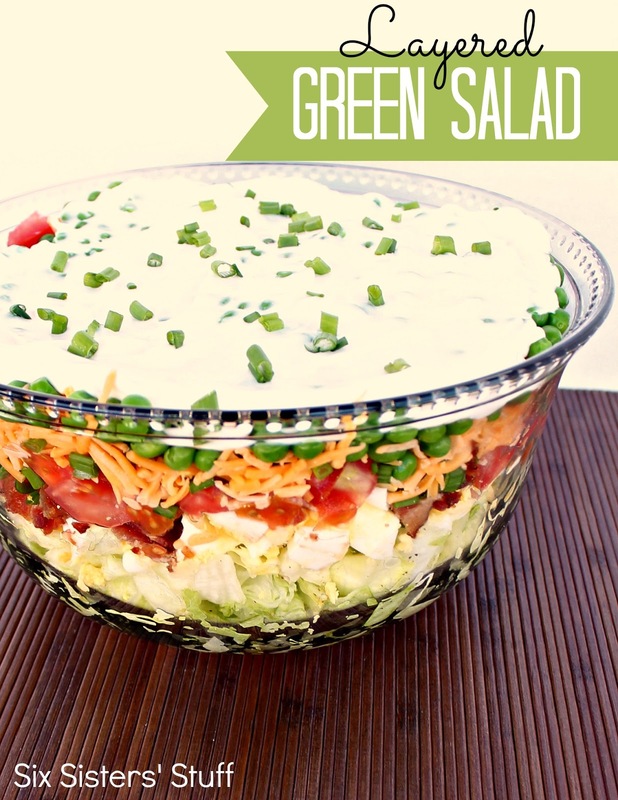 My husband has never been a salad fan, until we tried this tasty recipe! The flavors of all the layers blend together perfectly! This is one salad my family will be eating for a long time to come. It is also perfect to bring to parties or potlucks and can feed a crowd! A delicious salad with a simple homemade dressing that everyone will love! 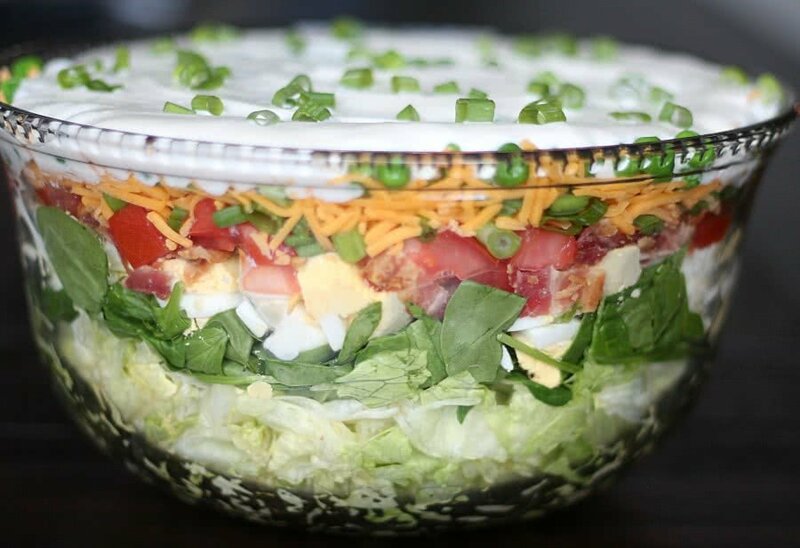 In a large glass bowl, layer salad ingredients in order listed above. Combine dressing ingredients in a separate bowl and whisk together until combined. Pour over the top of the peas and spread to cover. Cover and refrigerate for up to 8 hours. Looks great! So then do you toss it before serving or just scoop it out trying to get all the layers? So you make it and let it sit in the frig for eight hours before mixing? You let it sit in the fridge and the flavors all kind of mix together. You don't really mix it when you eat it. You dish it out and try to get all the layers on your plate! It is so yummy! This is the salad that my grandma always made! She made it in a 9X13. When I made it a while ago I used the frozen peas and put them in still partially frozen. 5 minutes later it was perfect! Thanks for sharing the recipe! this recipe is great for a take-along. the frozen peas in the bottom of the salad bowl tends to help things stay fresh and chilled AND bacon bit helps with things when one is in a hurry. yummy!! I am a salad lover?This one looks amazing! I?m sharing it tomorrow at this weeks Tasteful Tuesday party?Come on over and check it out? hope you can link up again this week :o ) Oh and grab a featured button while you are over! Link will go live Monday evening at 8:30 central time? Picture looks like it has grated carrot in it but it's not in the recipe list? It's grated cheese. You could totally add carrots to this recipe if you wanted too. A great way to get in more veggies. We have been adding a layer of sliced fresh mushrooms and a layer of chopped cauliflower. Lets me get a few more veggies in our meal. We love it. Been eating this salad since the '70's. Love it. I think it's important that the dressing on top covers the entire top to the outside edges, basically sealing it. I think that's what makes it taste so good: melding all the flavors.